The fun of a 1st birthday party is watching the guest of honor smash a birthday cake into their face, hair, and clothing. 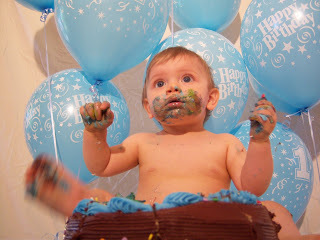 Cameras are flashing; family is laughing, all while the baby is reaching for another handful of cake. The audience cheers for the baby to get messier and the more they do it the happier the crowd. Have you noticed that everyone wants to hold the baby except when the baby has a diaper full or has birthday cake frosting from head to toe? Dads magically disappear with some project that prevents them for baby cleanup. Therefore, it all falls on mom to do the dirty work. Moms now have to struggle to clean the baby, but also keep themselves from getting dirty doing it. Moms have a change of clothes ready – you are going to get dirty cleaning up that bundle of joy. Kids squirm, faucets splash, cake frosting gets everywhere and just the confines of a bathroom make cleanup a difficult task. Mothers plan ahead and have extra clothing for the baby, but often forget about themselves. Prepare to have a second shirt or outfit ready for you. This way both mother and child will look their best for the remainder of the party. First birthday parties are a family event and expect everyone to be there on time and camp out until it’s all over. Yes, that’s right. Unlike other birthday parties where people come late and leave early, 1st birthday parties are a family event. People who’ve not seen the birthday child for months want to participate in the event. 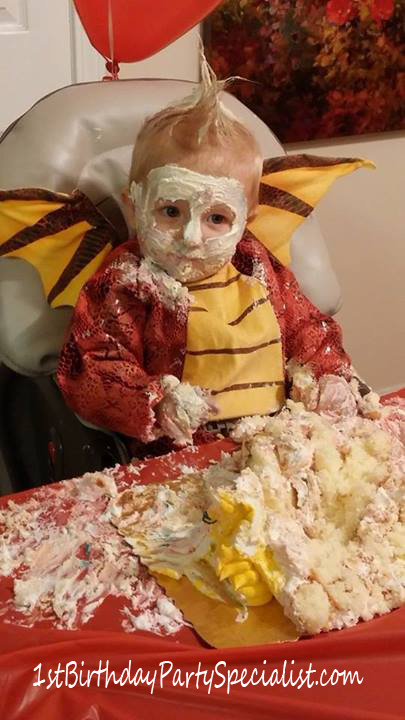 Parents who have older children like to relive their past and can’t wait to see the birthday child covered in birthday cake. Aunts, Uncles, cousins, and friends all bring gifts from practical to outrageous toys that take an engineering degree to assemble. So with that said, here are some tips to help you get through the 1st birthday party. Have a change of clothes for you and the birthday child. Remember part of the 1st birthday party tradition is a smash cake. This means the child will be covered from head to toe in cake and somebody, you – is going to have to clean them up. Which, if you like most parents, will get a cake for themselves too. If the party is at a hall, bring two cars. It’s going to happen, proud family members are going to buy presents that are large. Are they going to fit into the car – probably not? You’re going to have a car seat in one car and relying on people to help you hall presents back is not allows reliable, so best to plan ahead and take two cars. Hire a photographer – their experience in capturing the moment is priceless and will give you picture that family and friends will claimer to see. It’s a cost, but in the long run, you will be happy that you did. Tin Snips – What? Have you seen how they package kids toys nowadays? They have industrial plastic tie straps that the average household scissors strain to cut through. Use tin snips and cut right through the box and tie straps. Nap time is critical to babies; make sure the birthday child takes a nap. If you have to wake them up 1 hour earlier than normal, make them crawl around the house or just play with them that extra 20-minutes in the morning to tire them out just enough for them to want to take a nap. A 30-minute nap will make a world of a difference. You want a happy birthday child, so make sure they take a nap.